We have included this section for anyone with little experience in diy - we hope it may be of some help. Of course, one cannot expect to build a motorhome without some tools and equipment, however we believe it isn't necessary to have an extensive collection of power tools. 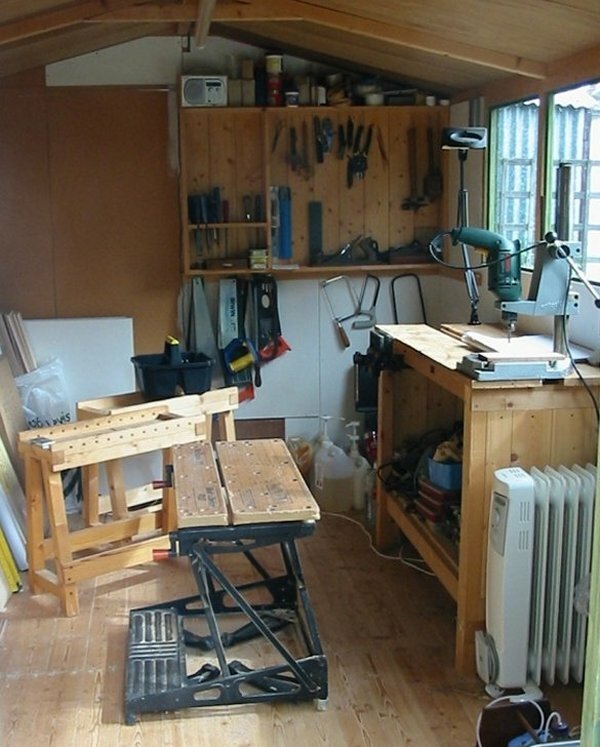 Our woodworking methods are old-fashioned, a mite slow perhaps, but they are simple, economical and work. We are fortunate in that we have both a shed and garage. Most of the construction work was done in the shed, we have a solid bench and vice there, also it is insulated so can be kept warm in winter. 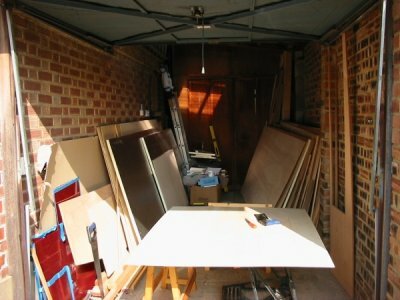 Much of the initial cutting up of the large ply sheets was done in the garden, or garage if it was raining; we store most of the ply sheets and timber in the garage. 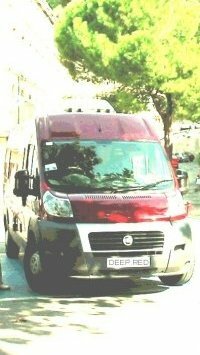 If one only has the van and all construction work has to be done inside it, then some means of storing sheet materials will probably be needed. Outside under a heavy polythene sheet should be ok, ideally stack plywood on edge and insulated from wet ground. Some days it seemed like miles walking back and forth and, invariably, we forgot to take the tools back and forth too. A lightweight easy to carry box in which to keep the most used tools proved a godsend. That's our one sitting on the trestle in the shed. The "WorkMate" is fine, but we also use two home-made (self-built!) trestles to support large sheets when sawing (as in the garage pic above). 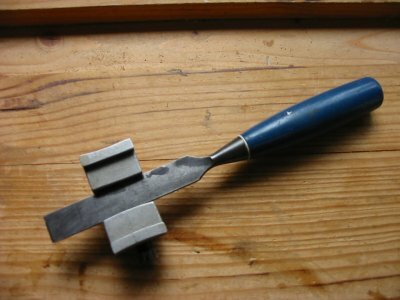 For making timber frame joints, the woodworkers' bench vice makes life much easier. We make no apologies for including items that may seem obvious to some - for this is a list of what we used. Pencils and rubber Buy a box of 12, one can never have enough. 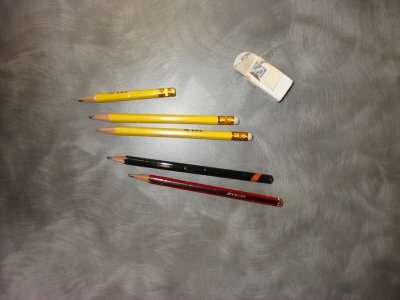 (Soft, 'B' grade pencils won't leave pencil line grooves in your lovely woodwork). A good eraser to use as you go - nothing worse than finding a redundant pencil line beneath the varnish on a lovely ply panel. A4 Spiral-bound notebook Very useful, not only for recording dimensions and making drawings, but scribbling ideas, supplier phone numbers, etc. 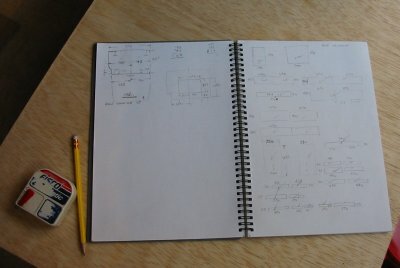 It has become our build diary. We are on second one. 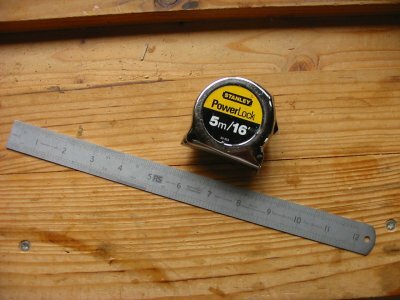 Rules (2) Steel flexible tape measure, this 5m/16ft. Buy best you can afford, it will be used a great deal, cheap ones lose accuracy. Steel rule, 300mm long (12inch), better for tight spaces and easier to use on the bench when marking out joints. 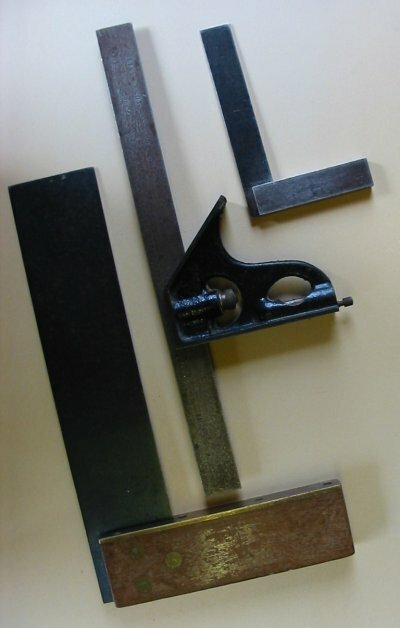 Woodworkers try-square or metal combination square For marking out, checking squareness. 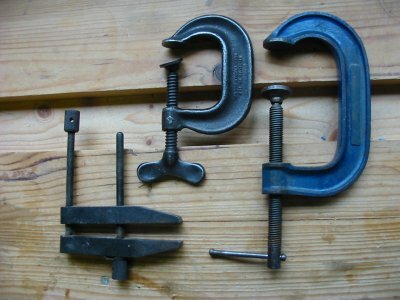 We prefer the Marples wood stock one for general use and the small steel one for marking out. 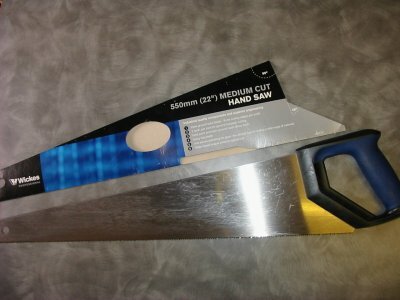 Panel saw Medium Cut; number of teeth (or points) per inch usually around 10. This ideal for 3-18mm thick plywood - won't leave too ragged an edge. Avoid very cheap versions that wear out quickly. Good throw-away types cost about £8-12 and will last a good few months or more; we've got through quite a few though. We scratch the date we bought it on the handle - when the saw starts to lose its edge we can tell from the date if it's a bit old and probably past it - bit like us really. Tenon saw Number of teeth per inch:12-13. The steel stiffening band along top of blade ensures accuracy when cutting joints in timber. Good throw-away types with hardened teeth that can't be sharpened are fine. Expect to buy more than one over time if doing much jointing. 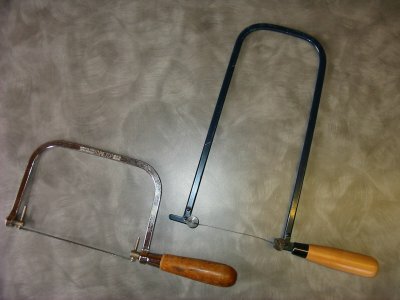 Beware these modern hardened-tooth saws can bite and leave a nasty injury - the teeth are very sharp and pointed. 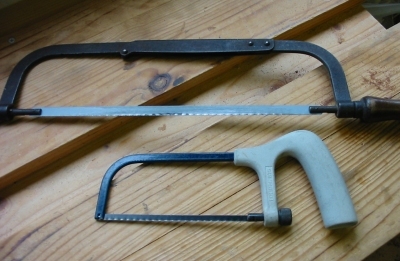 Coping saw and Piercing saw There are times, particularly when cutting thin ply when the powered jigsaw is too awkward, or too much muscle to use, these saws will often do the job in a more controlled manner. 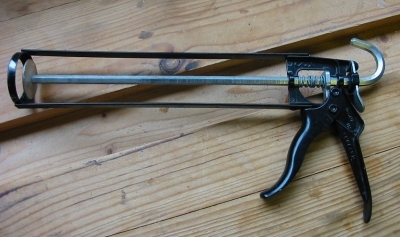 Pad saw Like the coping saw above, very useful tool for cutting out shapes in ply etc. when the powered jigsaw is not an option. 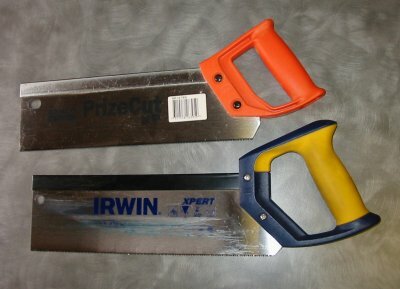 Hacksaw Standard size and junior hacksaws. Essential for cutting steel or aluminium plate, bolts, studding, etc. Stanley No. 5 Jack plane Sole about 350mm (14in.) long. Indispensible tool. This one has blade that needs resharpening on an oil stone. We've had it from new 40 years ago! Expensive tool these days, but there are similar cheaper versions and some that use replaceable blades. 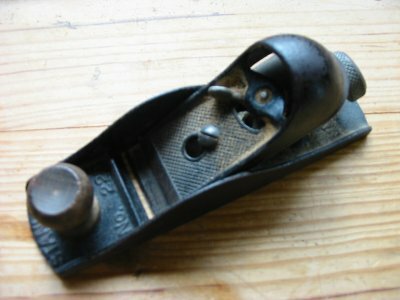 Block plane Stanley 220 block plane. About 180mm(7in.) long . Also has blade that needs resharpening. Ideal tool for planing down edging strips. 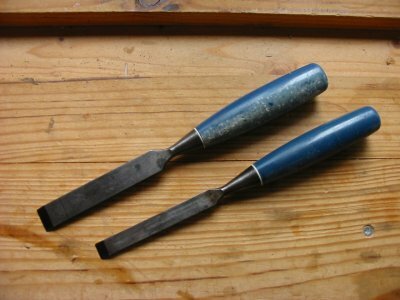 Wood chisel We have several, but a 6mm, 12mm and 18mm wide ones would be sufficient for making most joints. 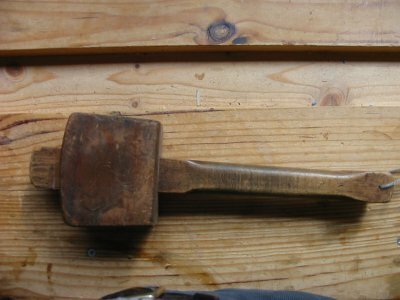 Wood mallet Not essential, but kinder to chisels and materials than a steel hammer. 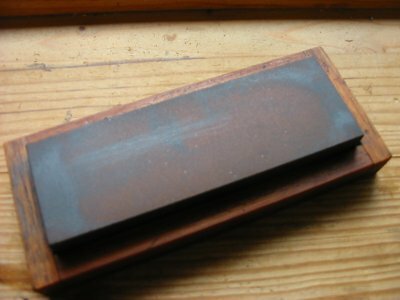 Combination oilstone For sharpening chisels and plane blades (and Stanley knife blades if you've run out). Has course stone one side and fine stone on other face. Sharpening guide tool This tool expands to take a standard plane blade in addition to chisels. Sharpening angle is easily adjusted. Will keep chisels etc at correct angle when sharpening on oilstone. Files Basic tool for shaping, deburring sharp edges, in steel, aluminium, wood, etc. Also for tidying up ragged holes in ply panels and window openings. 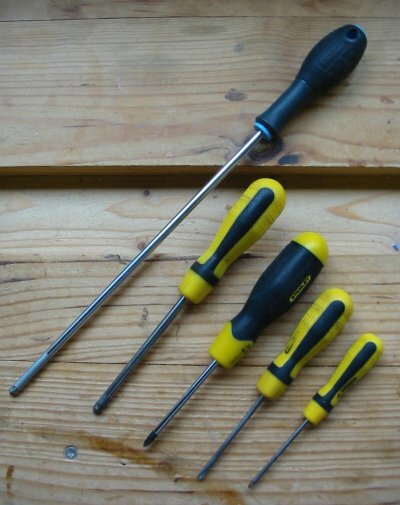 Screwdrivers A basic set of crosshead (Posi-drive) and flat-blade types in a selection of sizes will prove invaluable. Just the thing for your birthday present list - one can never have enough! The extra-long crosshead makes fixing/removing screws in awkward places much easier. Sealant Gun Basic sealant gun - fits Sikaflex sealant tubes. Buy a good quality one that is comfortable to hold (they're inexpensive) - it will get used a lot. Clamps We have a number of clamps collected over the years - good steel ones will last a lifetime. 0-100mm(4in) size are probably the most suitable for our jobs. Modern plastic ones are fine, supermarkets often have them at very keen prices. Twist drills We have a collection of HSS drills (High Speed Steel) gathered over the years. 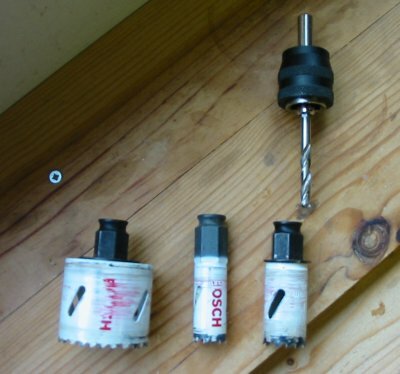 These are good for drilling steel, aluminium, wood, etc. 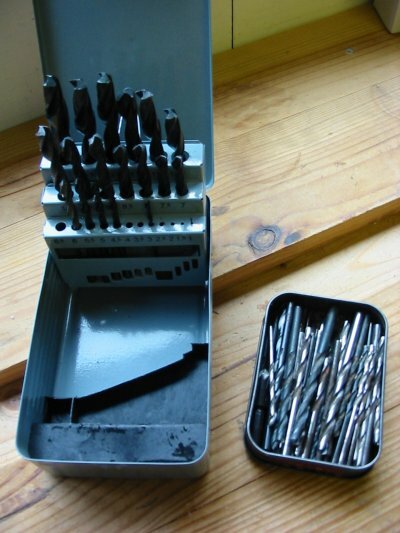 Carbon steel drills are ok for wood and soft metals but will lose their edge quickly in steel. 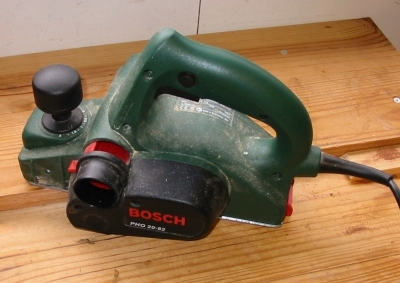 Holecutter and arbour Bosch type with interchangeable arbour/drill. Essential tools. We used 20mm, 25mm and 51mm sizes a great deal. Excellent tools for cutting all the holes you'll need in steel and ply etc. This range not expensive. 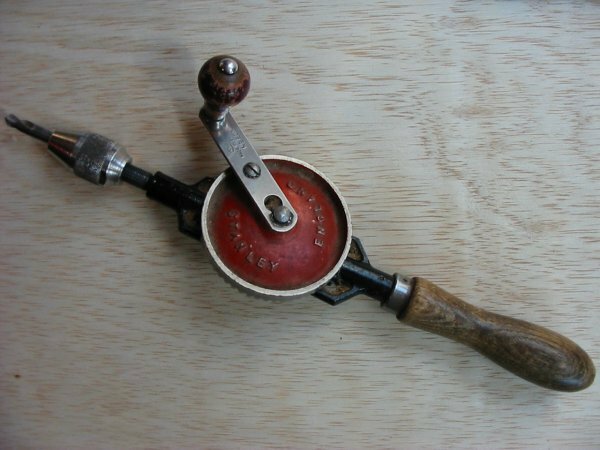 Hand drill Ancient tool, yet still ideal for holding countersink bits when screw holes need a countersink, or drilling starter holes when accuracy required. Saves a lot of messing about changing bits in the electric drill. 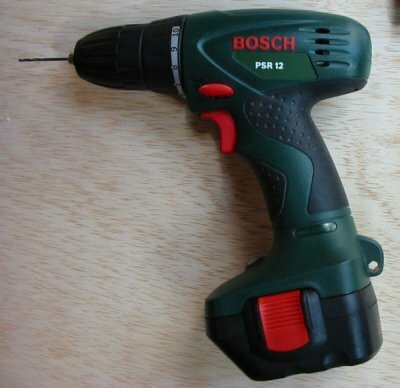 Electric Drill We have a battery re-chargeable one and a more powerful 240v one. The 240v. one has up to 12mm chuck capacity, good for drilling corner radius holes in steel for windows etc. A drill stand is very useful for accurate repetition work, i.e. drilling all those fixing screw holes in the bed slats. Electric Jigsaw This one is 240v mains operated. Worth buying one just for cutting out the window holes in the van sides. 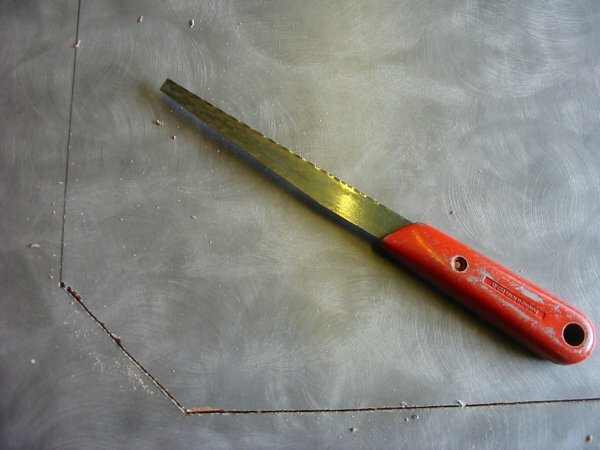 Used it occasionally for cutting ply sheets (floor panel shapes, worktop holes etc). Electric Planer Not essential by any means, but very useful tool for planing down stock timber to size. 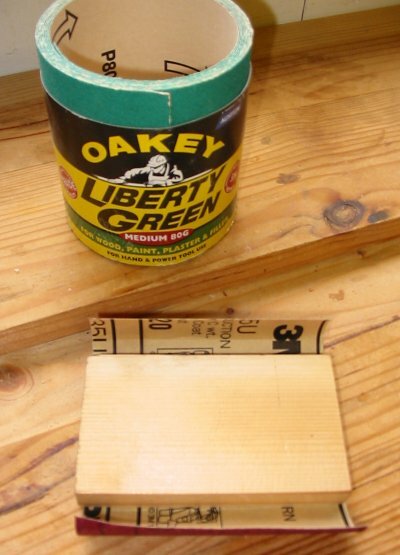 Typically for the many floor battens which had to be 25mm thickness, from nearest 32mm stock softwood. 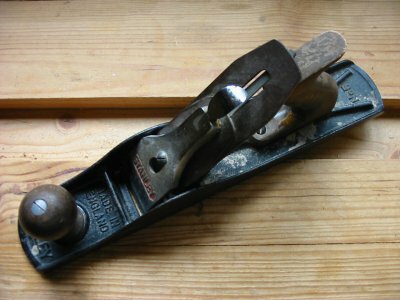 It won't replace my lovely Stanley jack plane though! 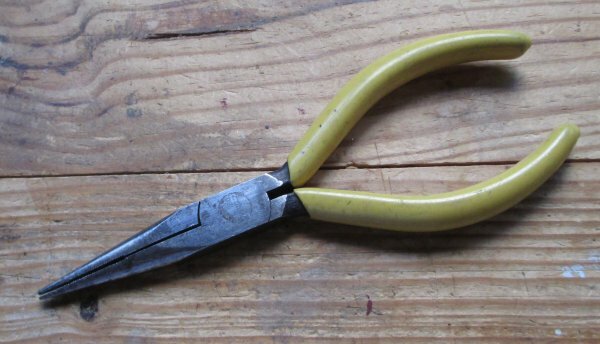 Wire cutters - small Small pair of wire cutters (sometimes called 'side cutters') and suitable for cutting most smaller cables up to 4-6mm diameter. More accurate and easier to use in confined spaces than general purpose pliers shown below. Wire strippers Adjustable wire strippers of this type make a good job of stripping insulation from cables up to 6-8mm diameter. Well worth the modest outlay as less chance of cutting into a cable's wire conductors when properly adjusted; makes life easier when stripping many cables of the same diameter too. 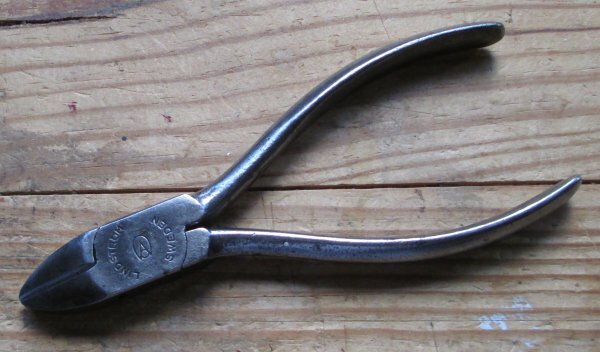 Pliers - long nose All sorts of uses in general wiring work, particularly in confined spaces. 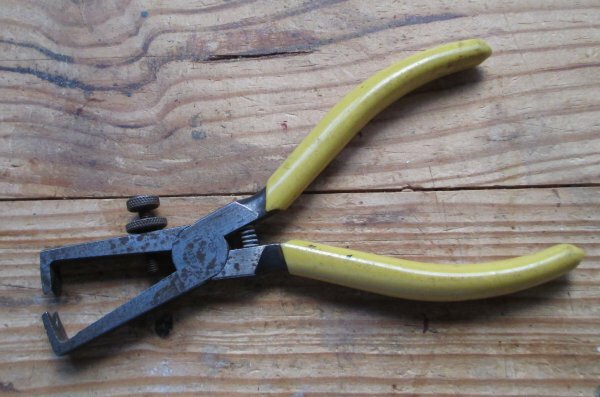 Pliers - General purpose This type will usually cut larger diameter cables up to 8-10mm diameter. 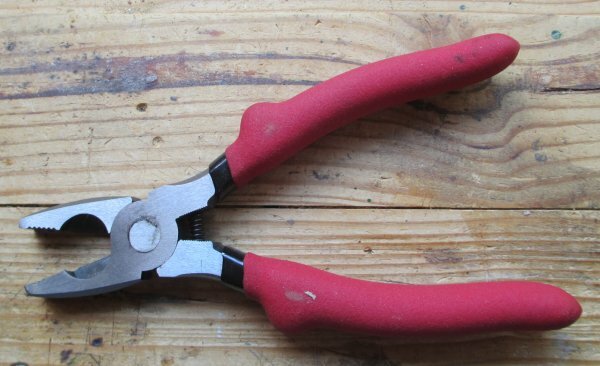 Pliers - Crimping Essential for crimping spade and smaller ring type terminals (up to approx. 6mm sq. cable). These crimpers came with an assortment of terminals in a box at an economical price. 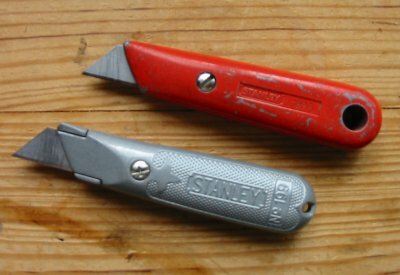 Can also be used as a wire cutter and stripper, however, when stripping insulation, we prefer the adjustable strippers shown above. Specialist crimpers are needed for larger diameter battery cables. Digital Multimeter An essential tool for testing/fault finding. Buy best you can afford and avoid really cheap ones. This model (Sealey TM100) cost around £25, it also has facility to test Amps flowing in a circuit (up to 10 amp - although only briefly). 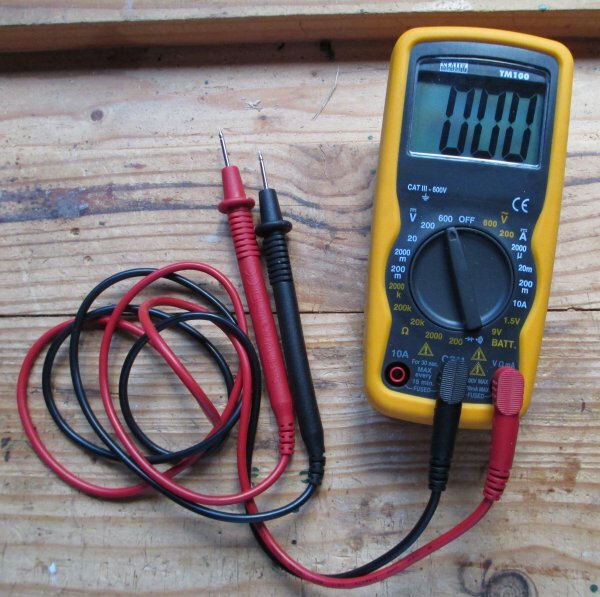 These days there are many types of multimeter, some are for specific uses and have many features which are not needed for our use. A 'general purpose' electrical meter is fine. 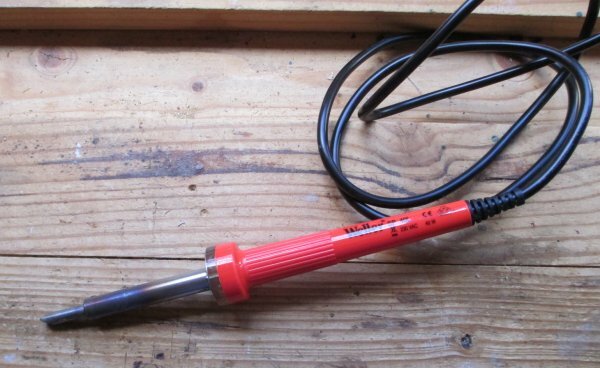 Soldering iron Not essential if one always uses crimp type terminals. We like the belt and braces approach, so we usually solder the wires after crimping on blade, or ring, type terminals. This iron is 40watt, but any iron between 20-40 watt should do fine for most uses. Masking tape B&Q Indispensible - so many uses. On a Deep Red painted steel van pencil marks used for measuring just don't show up - stick a bit of tape on and problem solved. 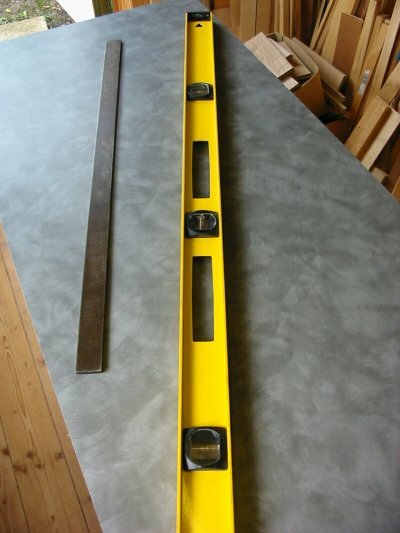 Useful as a temporary clamp to hold things in place - worktop edging is one example. Buy several rolls! 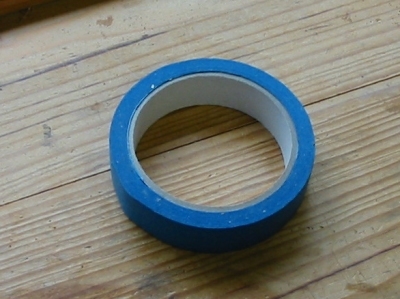 We like the B&Q blue tape, comes off easily and doesn't leave a residue of adhesive. Sikaflex 221 (White) Adhesive/sealant Sika UK A great product for gluing and sealing wood to metal, metal to metal, plastic to metal, etc. All the ceiling and wall battens, the floor grid timbers, and insulation panels in Deep Red have been fixed with Sikaflex. Important to follow the manufacturers clear instructions, available from their web site. We've used it extensively and have no hesitation in recommending it. Not cheap, lowest price we found £8.95 per tube (July 2013). 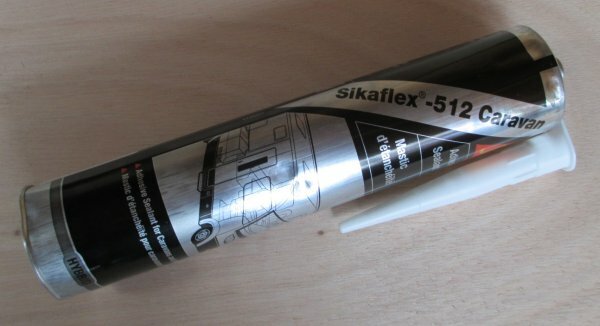 Sikaflex 512 (Black) sealant Sika UK Black version - this more for sealing gaps between windows, rooflights etc and bodywork. Same price as white (July 2013). 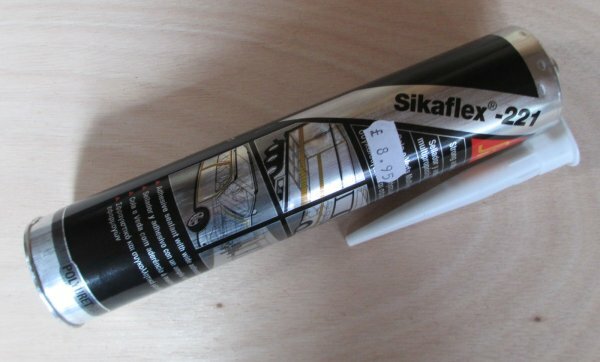 Sika UK Note, Sikaflex has a shelf life and tubes should have a small white label which shows the use-by date; on the tubes we've bought this date was at most only 9 months ahead; after that the contents noticeably begin to stiffen and become unusable. 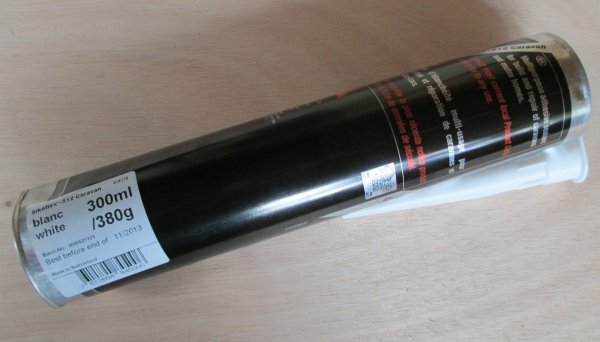 Beware of cheap tubes offered in places like eBay that don't have a use-by date label! 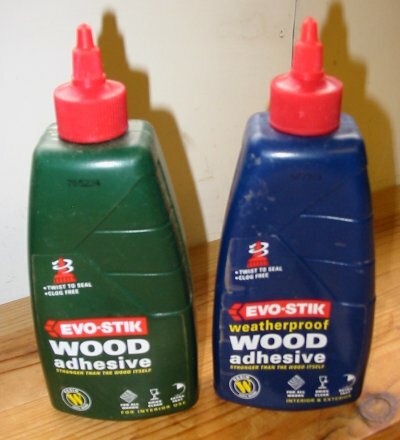 PVA Wood Glue Bostik General purpose wood adhesive. The weatherproof version (ideal where damp may be present) takes appreciably longer to dry and joints made with this type best left overnight. The normal version usually dries in an hour when weather warm. Wipe off excess glue with damp rag before it dries if surface is to be stained - glue will form a barrier coat otherwise and spoil finish. 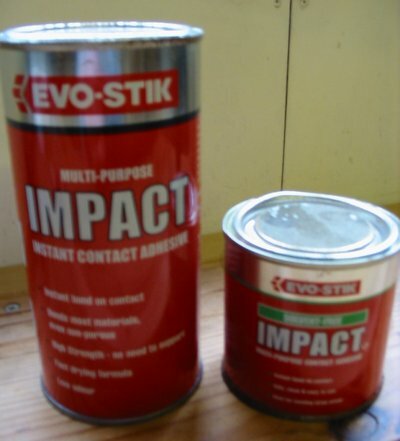 Impact (contact) Adhesive Bostik The tin on left is the original solvent type; the tin on right is solvent free version. 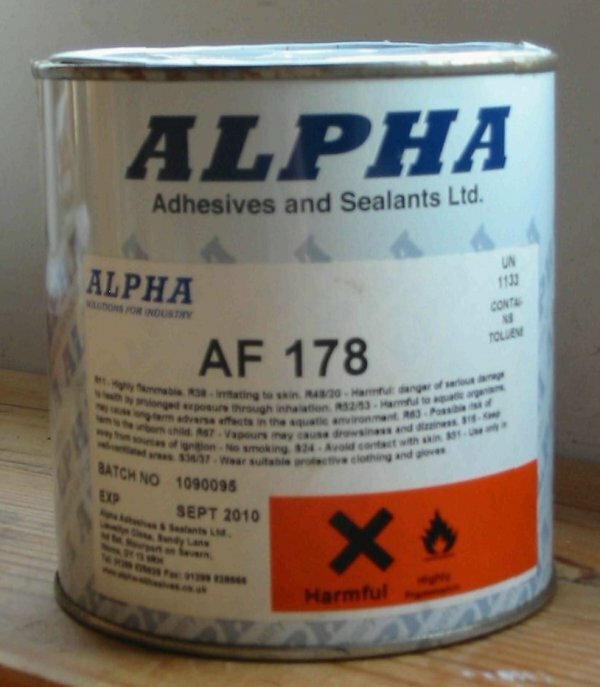 Good adhesive for fixing ply panels to frames and glueing large areas of different materials together. Bonds immediately giving little opportunity for adjustment. Thixothropic types are available which allow some adjustment of the parts being joined. Avoid breathing the fumes. Not suitable for use on surfaces subject to high temperatures (sticking materials to inside of van steel roof). High Temperature Adhesive Alpha Adhesives High temperature contact adhesive. Essential if fixing materials directly to van steel panels (e.g. flexible insulation). Bonds immediately giving little opportunity for adjustment. Avoid breathing the fumes. 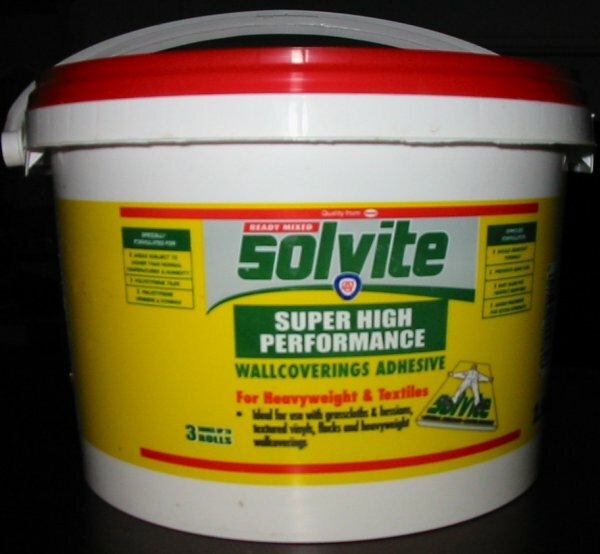 Wallcovering Adhesive Henkel Solvite High-performance wallcovering adhesive. We used this brand for attaching the vinyl covering to the ceiling ply; the acrylic-coated woven cotton wall covering to wall ply; and fixing the green cloth to the door ply. Excellent product, contents keep in tub for long time. 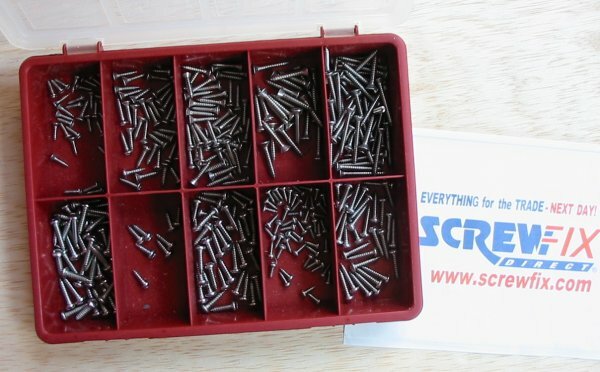 Woodscrews Screwfix Stainless steel woodscrews, assorted pack, both countersunk and pan head types. These types are hard, the heads are less likely to mangle when driven in tough material. Ideal for general uses and won't leave unsightly stains in wood frames where damp, or steam is present - fixing hinges of overhead lockers for example. 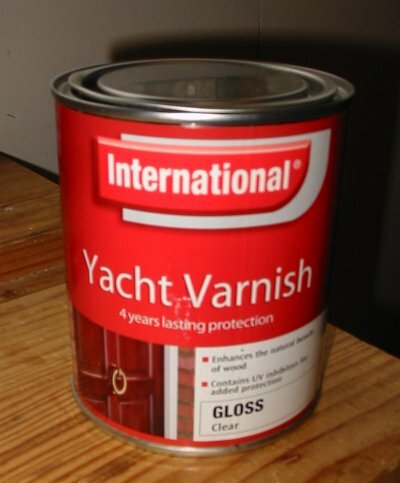 Wood Varnish International Paints Tough varnish giving excellent finish. Needs two coats minimum, takes several hours to dry, strong odour whilst wet, but worth the effort. Glasspaper B&Q Economical way to buy on a roll and just cut off enough each time to wrap aound sanding block. We mostly used 120 and 80 grades.